Crabtree Volunteer Fire Department responds to an average of 300 incidents annually, providing emergency fire protection, rescue, and medical first responder services to three municipalities surrounding the town of Greensburg, Pennsylvania, and housing their county’s trench rescue and structural collapse team. The concrete flooring in their three-bay garage remained unfinished from the time the station was constructed and began to crack, spall, and stain from decades of neglect and harsh use. In the spring of 2015, the fire company decided it was time to finish the apparatus bay floor and renovate the flooring in the adjacent offices and restrooms. Fire company personnel searched for concrete coatings that met several criteria: First, the coatings had to be durable enough to easily withstand the regular abuse it would face, look like new for years to come, and minimize any downtime associated with the application process. As Crabtree compared the features and performance of polyaspartic and epoxy coatings from several different manufacturers, it became clear that FLEXMAR® offered a superior polyaspartic coatings technology that would readily meet their needs. 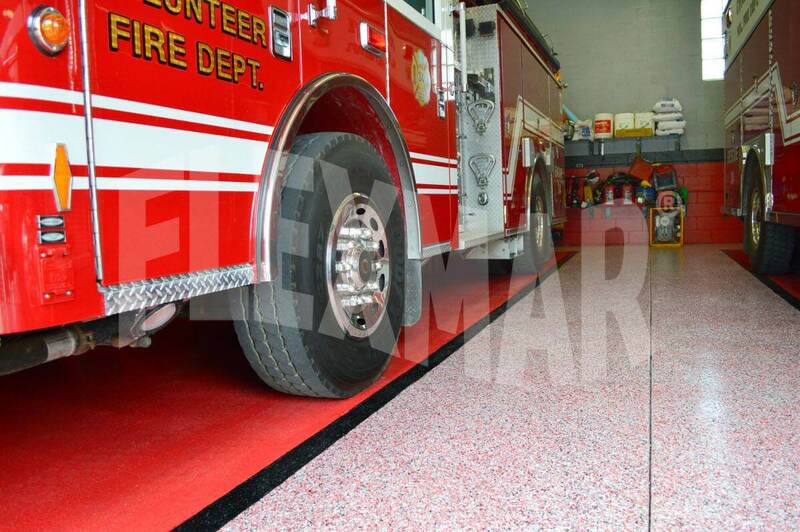 Crabtree Volunteer Fire Department selected FLEXMAR Coatings because a floor protected by FLEXMAR polyaspartics would be durable enough to withstand wear, abrasion, and hot tire attack from fire trucks weighing upwards of 25 tons. They resist staining from automotive fluids, hydraulic fluid, and other harsh chemicals. And they will look like new for years to come without fading, yellowing, or discoloring. But the coatings would not have a long cure or return-to-service time, which would keep the fire company out of their station—and out of service—for days at a time. The application crew created two separate visual areas with the vinyl chip system. The parking lanes were created by roller applying Safety Red FLEXMAR NextGenTM Self-Prime H.S. onto the concrete and broadcasting Cherry Bomb-colored flakes into the coating while it was still wet. The remainder of the floor surface received White Night Grey FLEXMAR NextGen Self-Prime H.S. and a broadcast of Lighthouse-colored flakes in the same manner. After about an hour, they were able to remove excess flakes and continue with the application. Next, the crew applied an initial coat of FLEXMAR NextGen Clear Coat H.S. polyaspartic sealer over the broadcast layer. Again, after about an hour, the floor was ready for the final step. Lastly, the application crew applied a second, final coat of FLEXMAR NextGen Clear Coat H.S. polyaspartic sealer with a slip reduction agent additive. This coat provides a higher final thickness and more gloss to the floor and “pops” the color. After about an hour, the floor was dry, and crews could walk on it to start putting equipment back into the application areas. 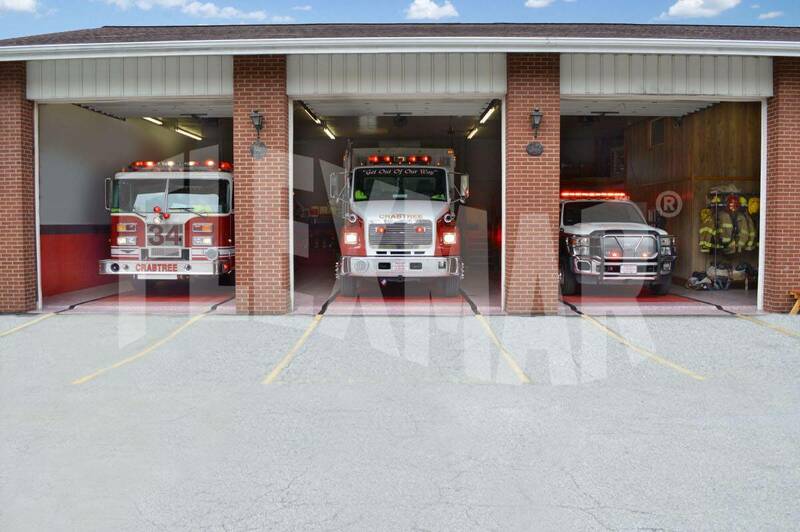 For Crabtree VFD, minimal disruption to their routine operations was essential. While epoxies and other polyaspartics require several hours—even days—of dry time between coats and prior to the floor being returned to normal use, FLEXMAR polyaspartic coatings dry in about one hour and the floor can be walked on in one to two hours after the application process. This meant that the system could be applied in a manner that virtually eliminated downtime and kept the department ready to serve its community as usual. 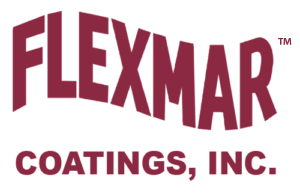 Once cured, FLEXMAR NextGen polyaspartic coatings and sealers provide a tough, hard finish that are up to four times more durable than epoxies and other concrete coatings. They form a virtually impenetrable surface when properly applied to concrete, resisting wear and abrasion, chips, and stains and degradation from a broad array of chemicals and mild acids. Of course, along with the coatings system’s superior durability, the vibrant colors “pop” from a glossy glass-like surface. 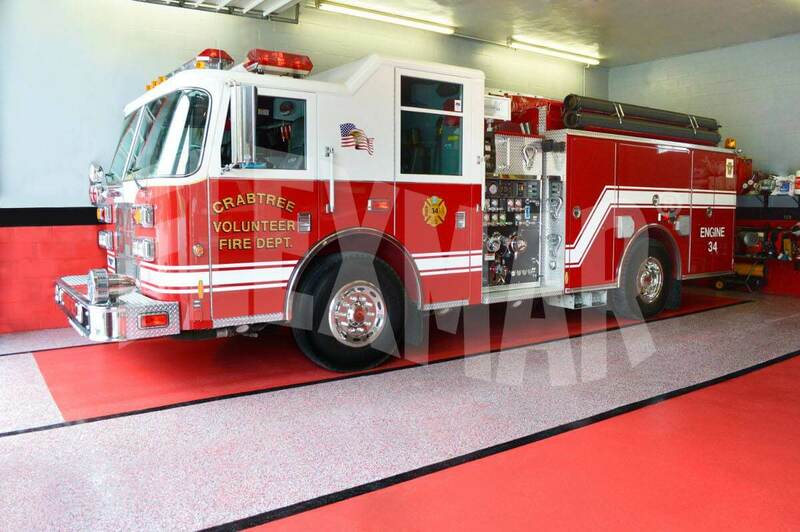 And polyaspartic coatings and sealers won’t fade or discolor when exposed to sunlight or UV lighting, so the colors will continue to pop and showcase Crabtree Volunteer Fire Department’s pride for years to come.